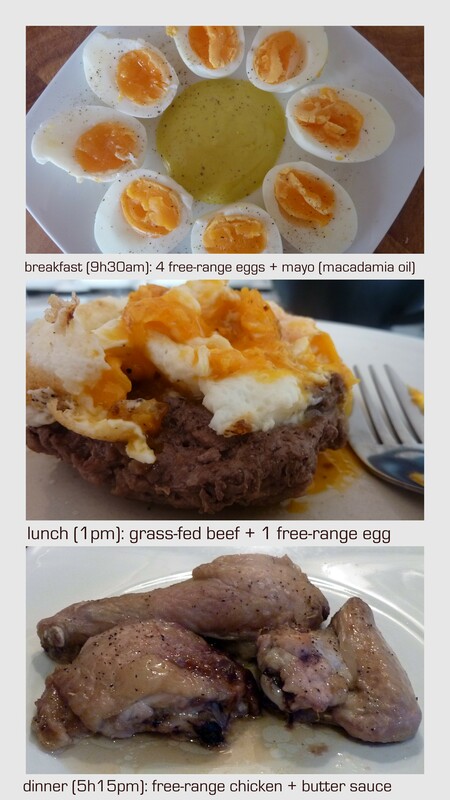 2nd day eating only protein & fat. I finally woke up with a flat stomach this am! Yeah! Although I had another episode of bloating in the am and the pm, it didn’t last more than 1 to 3 hours each time, so I consider it a big improvement! Apart from feeling very tired for maybe an hour after lunch, I felt great! For the first time in quite a long time, I had energy and good mental clarity and ability to focus. I was super thirsty all day long though and probably drank 2L of H20 & green tea! I’ll probably wait another day or two before reintroducing small amounts of veggies, just to be safe. This entry was posted in low-FODMAP / frucmal elimination diet [now] and tagged elimination diet, fructans, fructose malabsorption, low-FODMAPs diet, mannitol, paleo, polyols, sorbitol by Aglaée Jacob, MS, RD [radicata nutrition]. Bookmark the permalink. did it cause you to make a bowel movement? does almond butter count as protein and fat? Hi Heather! I am not sure what you are referring to about if “it”caused me to have a bowel movement, but yes I did have one today… lol Almond butter would count as protein and fat, but more fat than protein. Remember that almonds have a slightly unfavorable omega-6 to omega-3 ratio and should be consumed with moderation. Great blog, I have been interested in the Paleo diet for years and I already try to follow a low FODMAP diet, I was just wondering if you are trying to lose weight on this diet too. I am having a hard time eating FODMAP safe and losing weight. Thank you for your comment Brittany. Between my parasite infections and antiobiotic treatment, I actually gained about 12 lbs. in less than 2 months before finding out about fructose malabsorption. I realized that fructose malabsorption can lead to weight loss OR weight gain, depending on the individual… So yes, I have been trying to lose weight and in less than 2 weeks following a Paleo / low-FODMAP diet, I have lost 8 lbs. Eliminating carbs and eating mostly protein and fat has been working really well for me to get rid of these extra pounds! This is the only diet that has provided me with relief! Glad to have found your blog, yesterday. Best of luck! So glad you are feeling better. I hope you can find some veggies you can tolerate. Are you hungry at all? If I eat only protein and fat, I get hungry. Since I’ve been eating low FODMAPS I added more starch than I normally eat. Usually, potatoes. I’m wondering if this is why I’m not losing weight. I’m getting very depressed about this extra weight.